People come to Comet Cleaners with leather clothing and their fine linens every day. You can be sure that we would not have been able to open 175 locations across the U.S. and Mexico if all of those customers were unsatisfied with the work. You’re placing your trust in us, and we will treat your items with the same care and diligence that you do. You might have heard horror stories about dry cleaners ruining leather clothing with shrinking or staining. At Comet Cleaners we don’t take any chances with your valuable items. Our cleaners only use solvents that have been tried and tested on leather hundreds of times before. We always check the item’s tags for any special instructions or warnings about chemicals that will damage the material and act accordingly. We’ve been perfecting the dry cleaning process for 60 years—we would never take any job we weren’t sure we could perform. We’re going to be frank here: putting leather in the washing machine is never a good idea. Leather cannot survive being doused with water, and it could permanently ruin item. Dry cleaning, on the other hand, utilizes special solvents to clear away dirt and debris. The key to cleaning leather is using a powerful cleaner that is gently applied to the item. Despite being a durable material, leather is very susceptible to water and chemicals that are aggressively poured over it. Make sure your dry cleaners are only using solvents proven to be safe for leather. Tablecloths, comforters, and bedsheets can get very dirty very quickly. It is a bad idea to wash linens the same way you do clothes—they’re an entirely different kind of fabric and require particular methods in order to get 100% clean. Comet Cleaners uses safe, eco-friendly cleaning solvents that will remove all dirt and debris from these items. Save yourself from stains and smudges on elegant tablecloths by letting the professionals wash away all evidence of meals past. While it is almost never a good idea to throw linens in the washing machine, there are some that actually cannot even survive any laundering method other than dry cleaning. Always check the labels of items before washing them for any special instructions or warnings. Many items, usually very expensive ones, can be heavily damaged by detergent and water. At Comet Cleaners, we use proven cleaning solvents to clean comforters and linens. All of our solutions have been tried and proven true countless of times. We are familiar with all kinds of fabrics and which chemicals can harm them. When you bring your items into Comet Cleaners, they will be cleaned thoroughly and quickly. 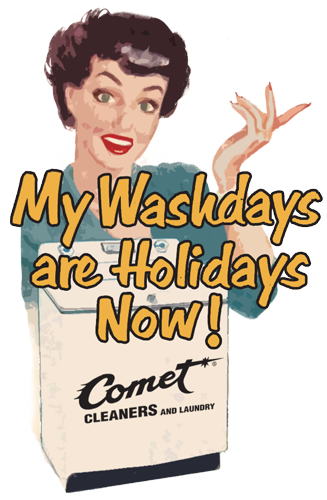 All locations offer same day services if you drop off laundry by 9 am. If you have any special requests, just let our team know when you stop by. We clean according to your preference.